John Moyers the son of acclaimed western artist, William Moyers (a member and three-time president of the Cowboy Artists of America), was bred to be a western artist. Although John Moyers was born in Atlanta, G.A., he spent most of his youth in New Mexico. John Moyers followed closely in the footsteps of his father beginning his career as an illustrator working as an animator at Walt Disney Studios in California. The indoor studiowork, however, was not what Moyers was driven to do, and in 1979 he accepted an invitation from Cowboy Artist Robert Lougheed to attend an artist workshop at a game preserve in British Columbia. 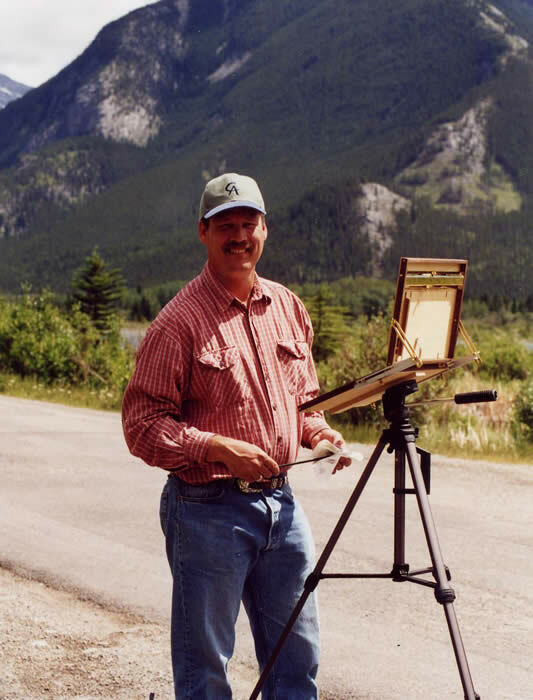 At the workshop, John Moyers honed his plein air painting skills, and met his future wife, Canadian native and fellow workshop attendee, Terri Kelly Moyers. 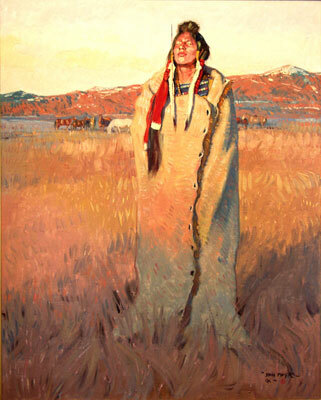 John Moyers, Blackfeet Winter, Oil on Canvas, 50" x 40"
Accuracy may be the best way to describe the art of John Moyers. 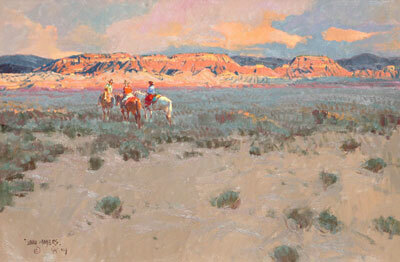 He captures the essential qualities of a scene by precisely representing colors and values. Moyers goes one-stepfurther by using authentic props making his pieces historically correct. The ability of John Moyers to capture these scenes has led to a successful career. John Moyers, New Gossip, Oil on Canvas, 24" x 36"